This occurs in the same way in sea water and fresh water. In a marine aquarium the vegetation is often less abundant than in fresh water, and so the nitrates, the end products of the nitrogen cycle, will have a tendency to accumulate. At high doses these pose little danger to fish but are toxic for invertebrates, especially corals. It is therefore important to eliminate them by partial, but regular, water changes. Once a marine tank has been put into operation, the nitrogen cycle is slower to take effect than in a freshwater tank: around 3-4 weeks (although this is a generalization, as every aquarium is unique). Fish or other animals must not therefore be put into the water during this period, although the length of time can be reduced by various means (see Assembling your Tank, page 218), based on the principle of introducing bacteria. 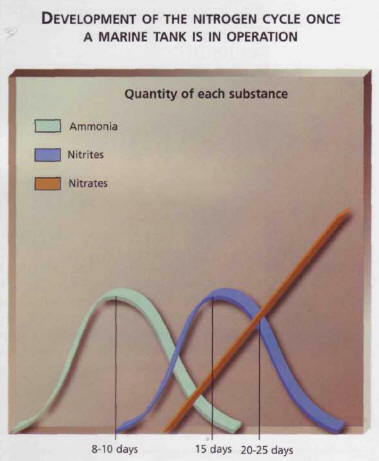 In any event, measuring the nitrite levels is an excellent indicator of the progress of the nitrogen cycle. Once the water has been put into the tank, this parameter must be measured regularly; when the quantity of nitrites goes down close to zero, the nitrates appear and you only need to wait a few days before inserting the fish. Nevertheless, measuring the nitrites at regular intervals is still highly recommended, as long as the aquarium is in use. ЮЙ , в китайской мифологии мудрый герой, спасавший мир от потопа.